Among the various approaches to the question of the nature of the mind (or soul), Augustine’s philosophical arguments for the existence of an incorporeal and spiritual substance in man and against materialism are here thoroughly examined on their merits as a source of insight for contemporary discussion. 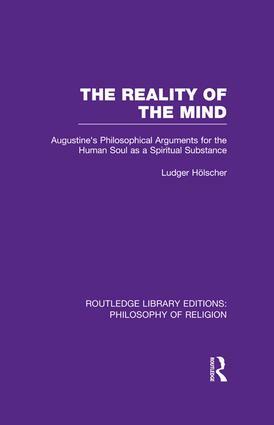 This book, originally published in 1986, employs Augustine’s method of introspection, and argues that, as a philosopher, Augustine can teach the modern mind how to detect the reality of such a spiritual subject in and through basic human acts and faculties, such as imagination, memory, knowledge, free-will and self-knowledge. It presents a critical dialogue with various materialistic anthropologies directly addressed by Augustine himself, or those which have arisen at later periods, including epiphenomenalism, mind-brain identity theory, Marxism and others.